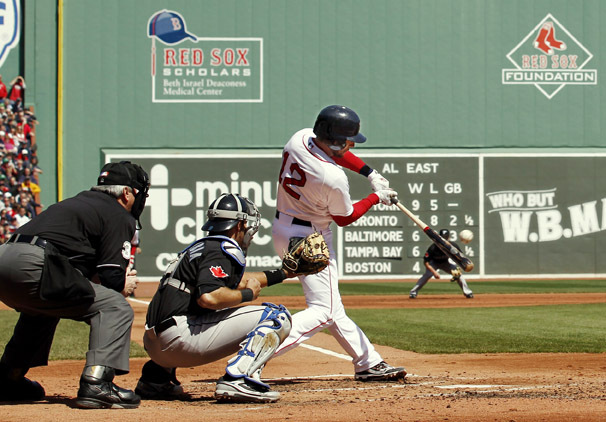 BOSTON — No major league baseball park has ever reached its 100th birthday. So the Boston Red Sox think Fenway Park deserves quite a party. The team began celebrations for Fenway’s 100th today, the 99th anniversary of its first game, by announcing a new website, a new logo and other marketing ideas designed to capitalize on the start of the beloved ballpark’s second century of service. Fenway opened on April 20, 1912, the same week the Titanic sank, and was saved from the wrecking ball in the early part of this century when the new owners led by John Henry decided to renovate it instead of tearing it down. After 10 years and $285 million in improvements, there are seats above the Green Monster, family restrooms, sushi at the concession stands and a whole new vibe that the team hopes can keep the ballpark in business for decades. Lucchino asked the fans in attendance — several longtime season ticket-holders and one as old as the ballpark itself — for ideas to celebrate the occasion, and they suggested commemorative pins and books, parades and posters that would tie together the ballpark’s first century. Lucchino himself suggested that the team rearrange the retired numbers on the right-field facade so that they hang in the order they were honored, instead of numerical order. They were originally displayed that way, but that left them as 9-4-1-8 — the eve of the team’s last World Series victory and thus an unpleasant reminder that it had been almost a century since. Now that the Red Sox have won two recent championships, fans seemed ready to embrace the old way again. So did Rice, even though it would put him at the end of the line. The original retired numbers were for Bobby Doerr (1), Joe Cronin (4), Carl Yastrzemski (8) and Ted Williams (9). Four more numbers have been retired: Carlton Fisk (27), Johnny Pesky (6), Rice (14) and the No. 42 all of baseball has retired in honor of Jackie Robinson. Also among the team’s plans: inscribed bricks ($250 and $475 apiece) for a plaza in the concourse, seats ($795 a pair) that were removed during renovations and hats and other memorabilia bearing the newly unveiled “Fenway Park 100 Years” logo. Through the website, the Red Sox are hoping to collect fan memories and artifacts that can be used during the anniversary year.